The difference between professional and amateur golfers is the golfer’s ability to stay focused and play each hole as a game in and of itself. I emphasize this point all the time. Other fundamental techniques include blocking out both head and outside noise. Both skills require intense concentration, resulting from mental discipline which I will can you to hone. For 20 years, I have coached players ranging from the average weekend enthusiast to members of the PGA. Success in golf largely relies on mental fitness. During sessions, I will be identifying the weakness in your particular technique, applying the notion of neuroplasticity in the form of Clinical Hypnosis in order to eliminate the pent up belief systems that crush focus on specific shots. After seeing me, golfers learn to take serious strokes off their stress level, finding the serenity they need all the while staying sharp. Want to get similar rewarding results out of your own game? (You might improve so much you’ll get addicted to golf!) Call my office to inquire about hypnosis for golf and get all the details and scheduling options at (212) 599-3195. 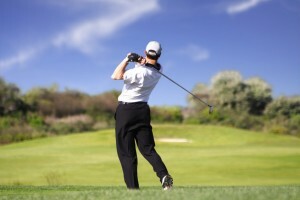 This entry was posted in sports hypnosis and tagged concentration, focus, golf, sports by Dr. Errol Gluck. Bookmark the permalink.